The neighborhood of Flushing in Queens, New York has become my home away from home in regards to dim sum explorations. 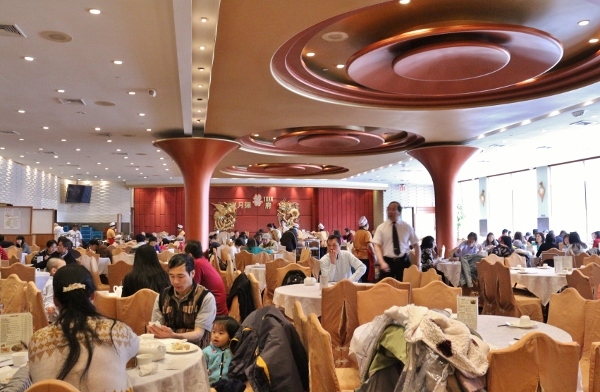 On nearly every visit to the Big Apple over the past several years, I have made it a point to visit Chinatown in Flushing to get my dim sum fix, along with doing some shopping in the neighborhood, both for food and kitchen gadgets. The epicenter of my visits to Flushing is always Jade Asian Restaurant. 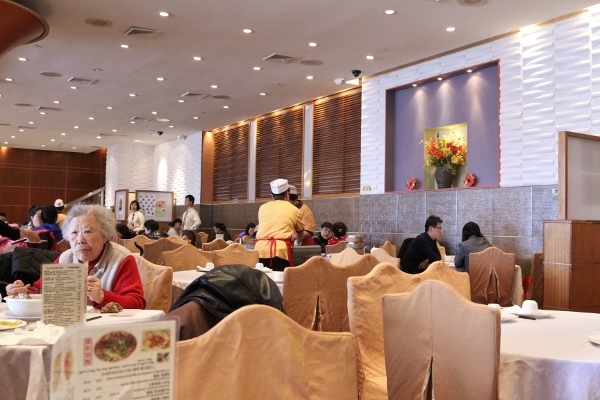 It features a large banquet room, where on busy days you may find yourself sharing tables with other dim sum lovers, and even potentially waiting in long lines to be seated, namely on weekends. I have only visited Jade Asian on weekdays, so I've managed to avoid the traffic/lines for a dim sum fix. I highly suggest stopping by midweek if you're able, since I believe the prices are lower on weekdays as well. Although I have visited Jade Asian Restaurant countless times, I've only discussed it once previously on Mission: Food almost three years ago. 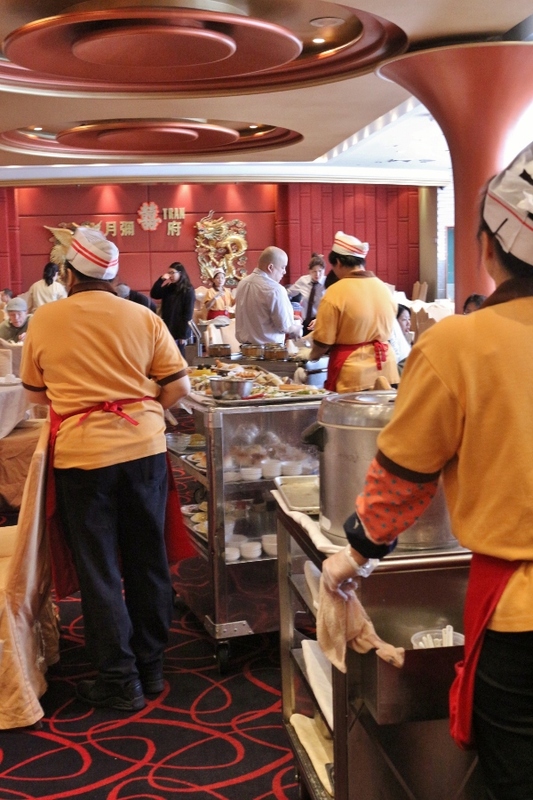 Feel free to check out that post for additional dim sum photos and thoughts on the experience. Today I will do a basic rundown of my most recent meal at Jade Asian. We actually skipped some of the classic dumplings, like Har Gow and Siu Mai, and focused on some of our other favorites. There were also only two of us dining on this occasion, which means less people to share with, and less dishes overall (but you'd never know it from looking at everything we ate!). Usually, a meal of dim sum includes several items including shrimp, but on this most recent visit, we limited our shrimp consumption to these rice noodle rolls filled with shrimp. 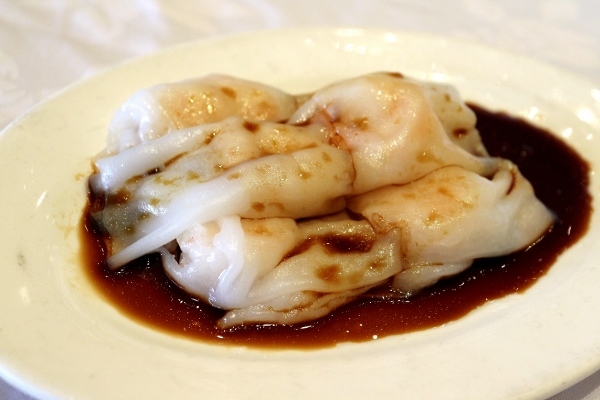 This is a perennial favorite, and a dim sum outing would be incomplete without an order of these. We also usually get a minimum of two different types of dishes containing char siu, or Chinese BBQ pork. 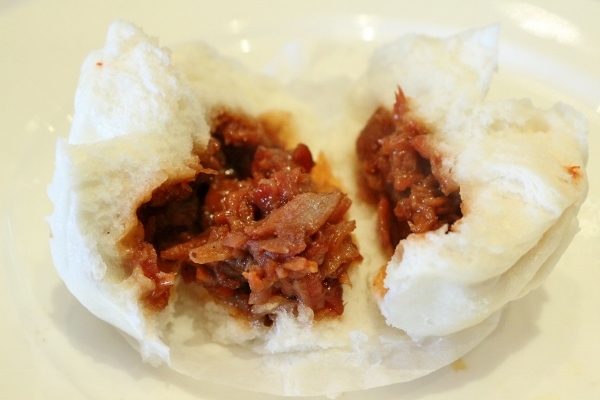 First, we had the steamed char siu bao, or buns. These are pillowy and fluffy in texture on the outside, and sweet and meaty on the inside. 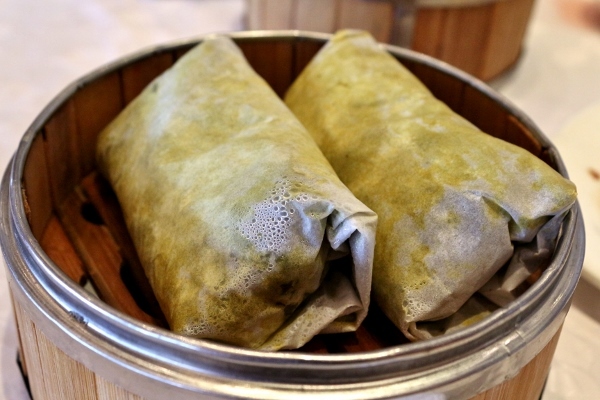 They are quite possibly the perfect dim sum menu item, and probably my all time favorite. I like to rip them in half with my fingers before eating them! 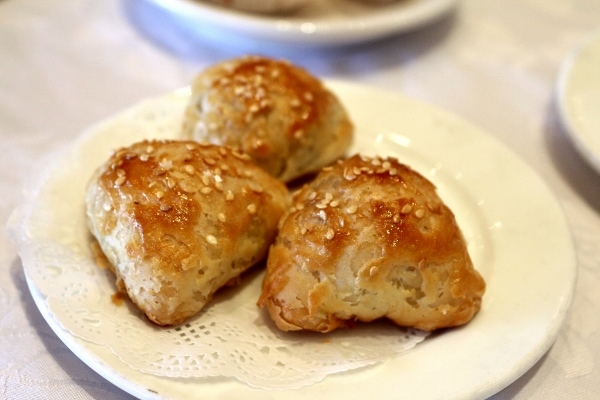 Additionally, we also love the char siu sou, or pastries. 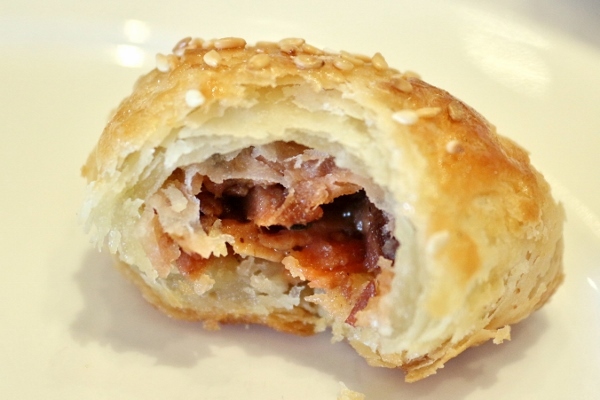 These feature the same delectable pork filling, but with a flaky crust. These are dangerous because they almost remind me of a meaty dessert! 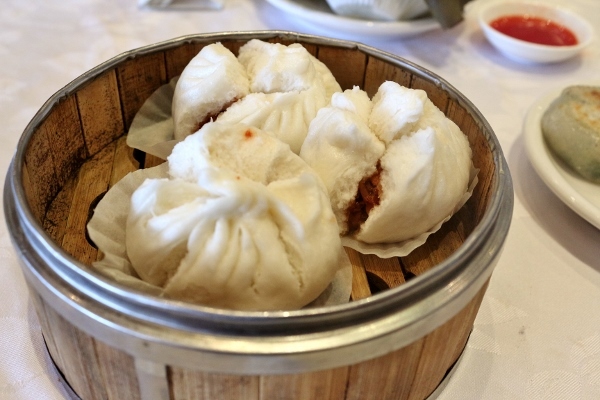 They are outstanding and easily hold their own beside their popular cousin, the char siu bao. I'm also a big fan of Chinese chive dumplings. They are made with wheat starch dough, but unlike most dumplings made with this translucent dough, these are actually pan-fried. I've actually made these in my own kitchen before, although the ones here contain a lot less shrimp than the homemade version. I did discover some crunch in the filling, which is possibly attributable to water chestnuts of bamboo shoots, I'm not really sure. Either way, these are a tasty addition to any dim sum meal. 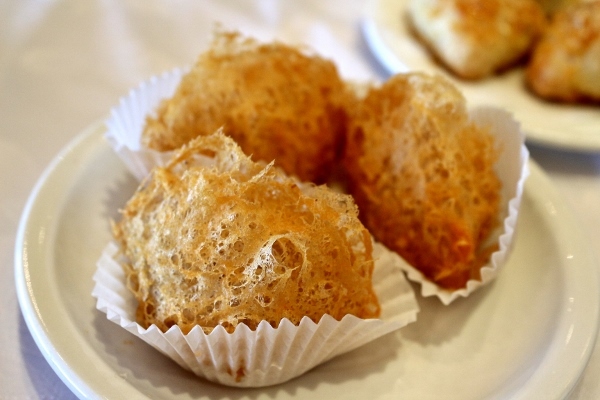 I'm also a fan of these ethereal fried taro dumplings. 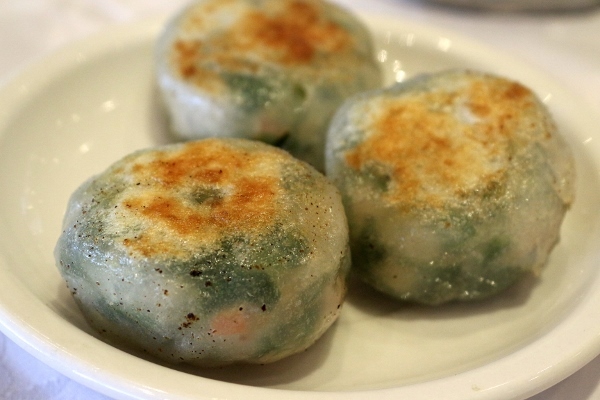 The exterior is made with a dough containing mashed taro, which is then filled with stewed pork, making this almost like a meat-and-potatoes type of dumpling. 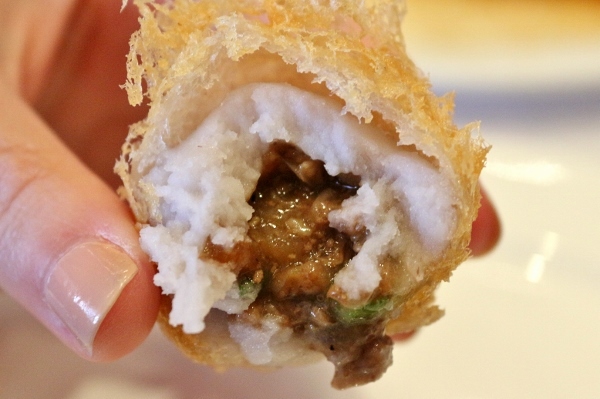 Once these dumplings are deep-fried, the exterior of the taro dough becomes gossamer and light, with a decadent creamy interior to the dough, and a rich meat filling. These are a tad heavier because they are fried, but I love them all the same. 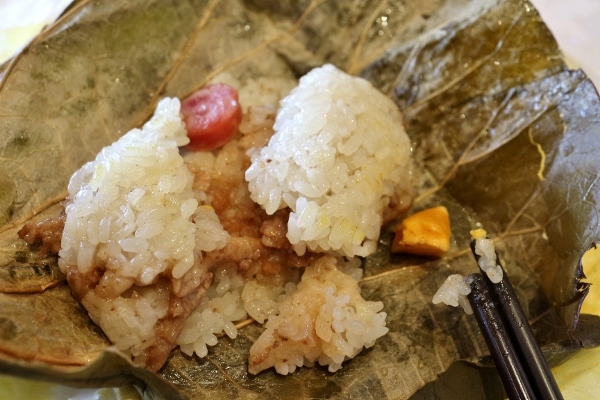 Lo mai gai, or sticky rice in lotus leaf, is another classic. A mixture of sticky rice, ground pork, Chinese sausage, egg yolk, and sometimes even mushrooms or chicken generally make up the filling of these steamed morsels. 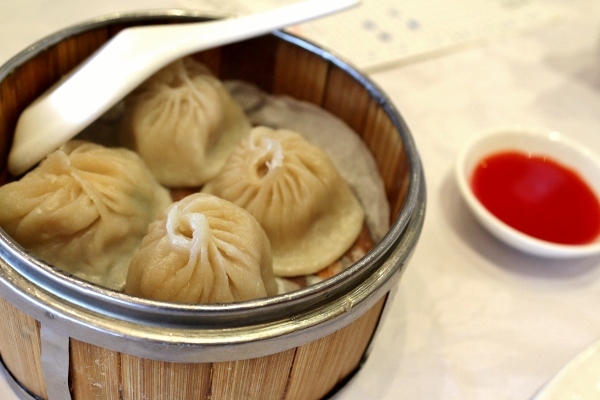 Another favorite dumpling on my long list is xiaolongbao, or Shanghai soup dumplings. There is truly an art to eating these dumplings. You either take a small bite or use a chopstick to poke a hole into the dumpling skin, while holding it over a soup spoon. Then drain the soup out of the dumpling, slurp it up and enjoy your dumpling. You can also add a little vinegar to cut through the richness of the broth. The ones served at Jade Asian range in their soupiness. A couple of our dumplings yielded a decent amount of soup while a couple seemed mostly dry (either they leaked a bit or weren't as full of the soup/gelatin mixture). 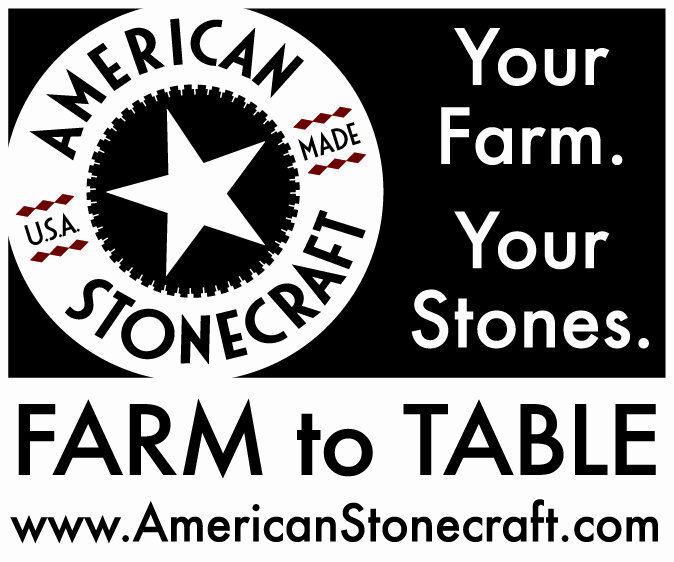 Either way, they are always a tasty treat! We certainly can't skimp out on dessert. 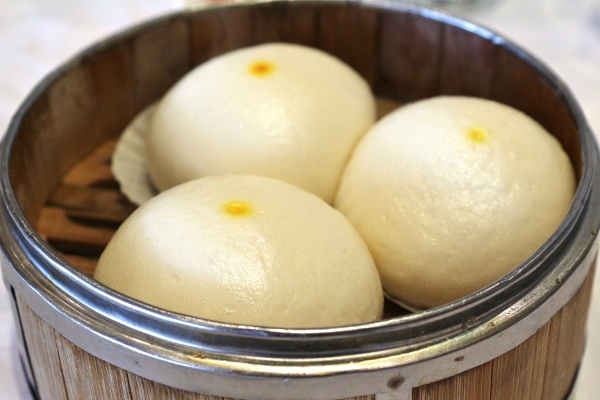 After nearly every dim sum meal, we always manage to save some room for these delicious steamed custard buns. 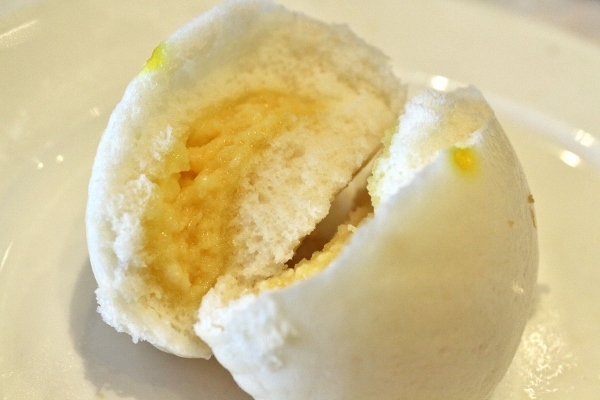 They feature the same basic fluffy dough as my beloved steamed char siu bao, but with a rich and sweet custard filling. There's really no better way to end a visit to Jade Asian than with a sweet finish. 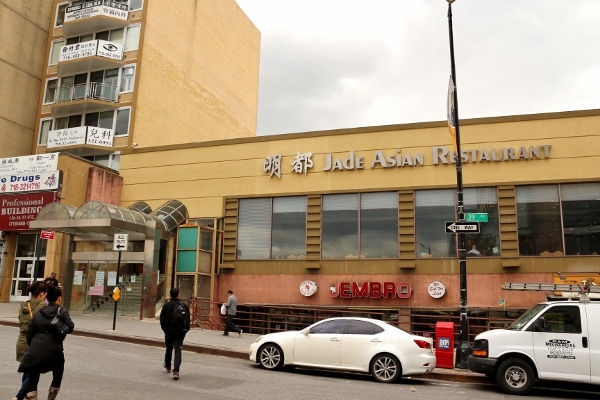 Although there are many wonderful eateries in Flushing's Chinatown, I seem to only have eyes for Jade Asian. 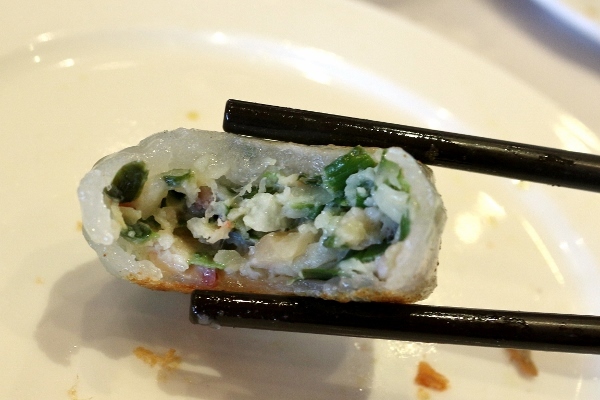 I hope you've enjoyed this little culinary tour, and perhaps it will inspire you to seek out some dim sum in your local area (I've even found some in my hometown in Rhode Island!). And if you're ever in New York City, please consider a little field trip out of Manhattan to discover the culinary delights that can be found in Flushing. You won't be disappointed!